NOTE: org.teiid.net.socket.SocketServerInstanceImpl.RemoteInvocationHandler has defined a getInstance() abstract method, eatch time the InvocationHandler implement, a org.teiid.net.socket.SocketServerInstance be return. 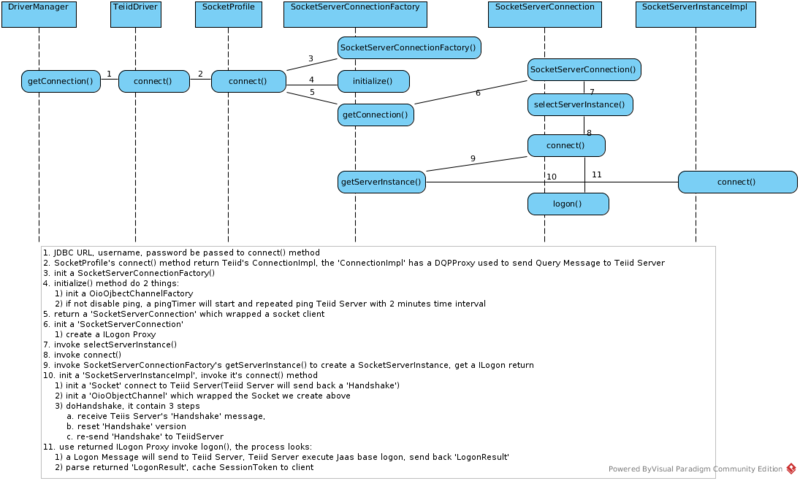 Step 10 - UML of OioOjbectChannel, note that, ObjectChannel has 2 implementations, OioOjbectChannelFactory for client, and org.teiid.transport.SSLAwareChannelHandler.ObjectChannelImpl for Server. org.teiid.netty.handler.codec.serialization.ObjectDecoderInputStream - used to read Message from Server. While Teiid Server Started, it will create a SocketListener which listen for new connection requests and create a SocketClientConnection for each connection request. The SocketListener bootstrap netty server worker threads with port number 31000, SSLAwareChannelHandler is the handler used by netty server side, it’s messageReceived() can be thought as teiid server side entry point. Once a client request in, this method be first invoked. 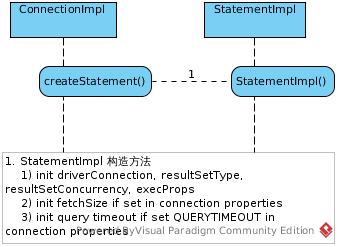 Sockets implementation of the communication framework class representing the server’s view of a client connection. Implements the server-side of the sockets messaging protocol. The client side of the protocol is implemented in SocketServerInstance. It’s processMessagePacket() method be invoked for handling income request message. DQPWorkContext is a filed of SocketClientInstance, DQPWorkContext’s runInContext() method be invoked, the constructed ServerWorkItem passed as a argument. 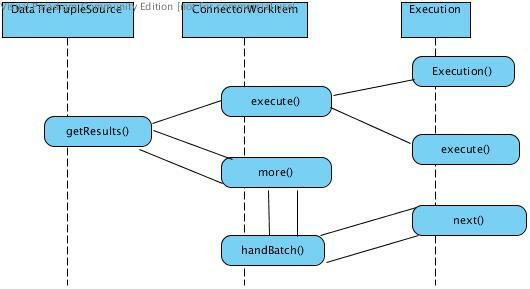 Then ServerWorkItem’s run() method be invoked. what ‘executeRequest’ method is a Entry Point for client request, it has parameter RequestMessage which contains client query command, and the method return ResultsMessage which contains the tuple results. Usually this methods be invoked after execute(), this method will invoke Execution’s next() method repeatedly, return list of rows existed in data source.